In Paraguay, the Ayoreo people are fighting for their very survival. These indigenous people are struggling to save their ancestral home in the Chaco region from cattle companies, farmers and religious sects who are moving into the region and clearing the land. New arrivals do this to make the land suitable for farming and grazing cattle. The combination of burning and then bulldozing the land leaves the region barren. The Chaco region in southwestern Paraguay is one of the most inhospitable lands in South America; while it composes 60 percent of the country’s area, it is inhabited by only two percent of the Paraguayan population. Popular filmmaker and conservationist David Attenborough has praised the beauty of Chaco calling it “one of the last great wilderness areas left in the world” and called for its protection due to the many plants and animals that inhabit its dense forests. While the Ayoreo people were legally awarded some disputed land by the Paraguayan government, two Brazilian beef corporations, BBC S.A and River Plate S.A are refusing to hand over the land until they are sufficiently compensated. These companies are seeking permission to clear a large area of land bordering on the Ayoreo’s. This will mean fencing the Ayoreos in to a smaller area, marginalizing them even further. Although many Paraguayan officials support expanding the cattle and farming industries throughout the Chaco as a means to boost the economy, the long-term damage to the nation from both a human rights and an environmental perspective would be catastrophic. The practice of slash and burn agriculture will only bring short-term benefits at the expense of Paraguay’s ecology and the destruction of the Ayoreo people. 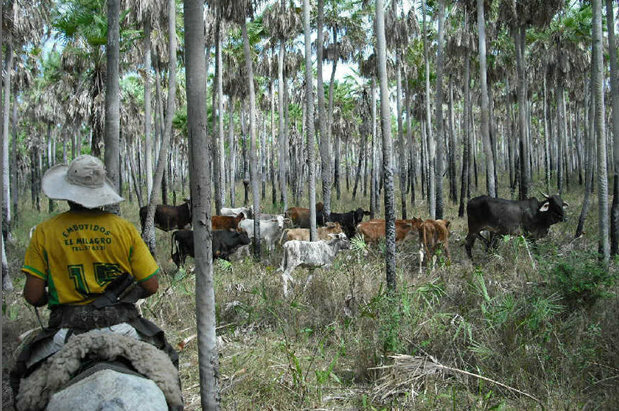 The Ayoreo-Totobeigosode, a sub community of the Ayoreo, is one of the last uncontacted groups in the world, Brazilian beef corporations, wealthy farmers, and Mennonite communities seeking remote areas in which to live a life based on a literal translation of the bible are encroaching on the Ayoreo lands. In the 1950s, the Ayoreo people lived in an area 2,800,000 hectares; now they claim only 550,00 hectares – a loss of nearly 80 percent. According to the BBC, over 1 million hectares have disappeared since 2007. Moreover, the new arrivals into the Chaco region have brought diseases, such as measles that were previously unknown to the Ayoreo people. Survival International issued a report to the United Nations’ Committee on the Elimination of Racial Discrimination (CERD) on 10th August, 2011 stating that the Ayores-Totobeigosode face the “imminent danger” of extermination. There are only 5,600 Ayoreo Indians left today with about 3,000 living in Bolivia and 2,600 in Paraguay. The Ayoreo people were lured out of their homes and into modern society with promises of a better life; many were dragged out forcibly. As Aquino Picanerai, a member of the Ayoreo recalled, “they brought us to the world of the white people and locked us up in this concentration camp.” Lacking the necessary skills to thrive in modern society and disenchanted with their situation, these indigenous people have since returned to their more traditional way of life. Others rejected modernity from the start, opting never to leave the forest, hoping to remain hidden and unmolested from the outside world. Sadly this will not be the case. Rising beef profits and the availability of cheap land continues to bring speculators seeking fortunes into the region. Certain government officials in Paraguay have expressed the need for investment and claim that the human rights and deforestation situation has been exaggerated. Paraguay’s weak laws facilitate the wholesale destruction of the forest. Under current Paraguayan laws an individual or corporation is allowed to clear forest on up to 75% of its land. They may then sell the remaining 25 % to another entity who is entitled to clear 75% of that plot. The process leads to the complete destruction of that land. Last year, Paraguay’s congress failed to pass a law that would have placed a ban on deforestation in the Chaco region. In an attempt to explain public silence on injustices being perpetrated in the Chaco region, Benno Glauser, the Director of Iniciativa Amotocodie explains “public opinion has no opinion on the matter”. The Chaco is at the periphery of a country of little international importance. Even in Paraguay, the Chaco does not embody the homogenous Guaraní society composing the majority of the population – more than 98 percent of Paraguayans are either mestizo or of primarily European descent. In contrast, the wilderness of the Chaco is sparsely populated by indigenous tribes and religious isolationists. In the public discourse, the cause to save the Ayoreo remains an obscure impediment to economic development. If this matter continues to fall on deaf ears then the allure of profits at the expense of humanity will prevail.